with change for a better living? Nuwik ChAir Holder. Room to breathe. Living in an attic with hardly any place for shelves and wardrobes? 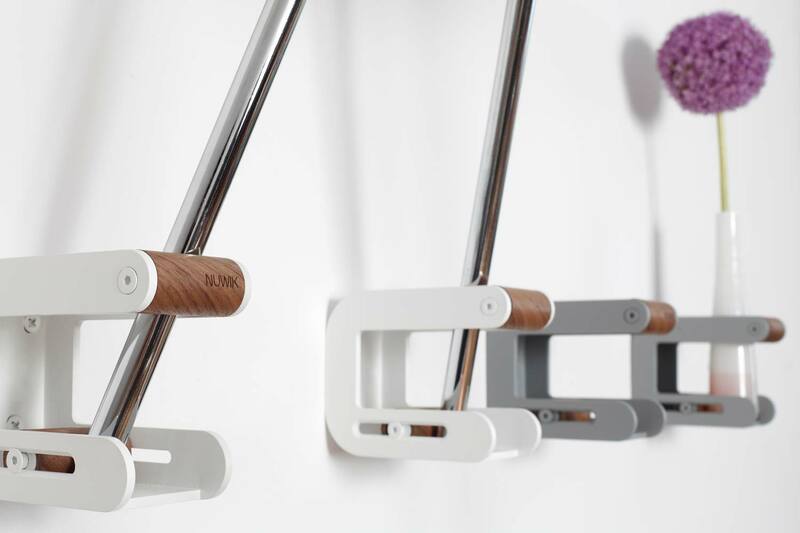 With Nuwik ChAir Holder, it doesn’t matter that your walls rise at an angle. 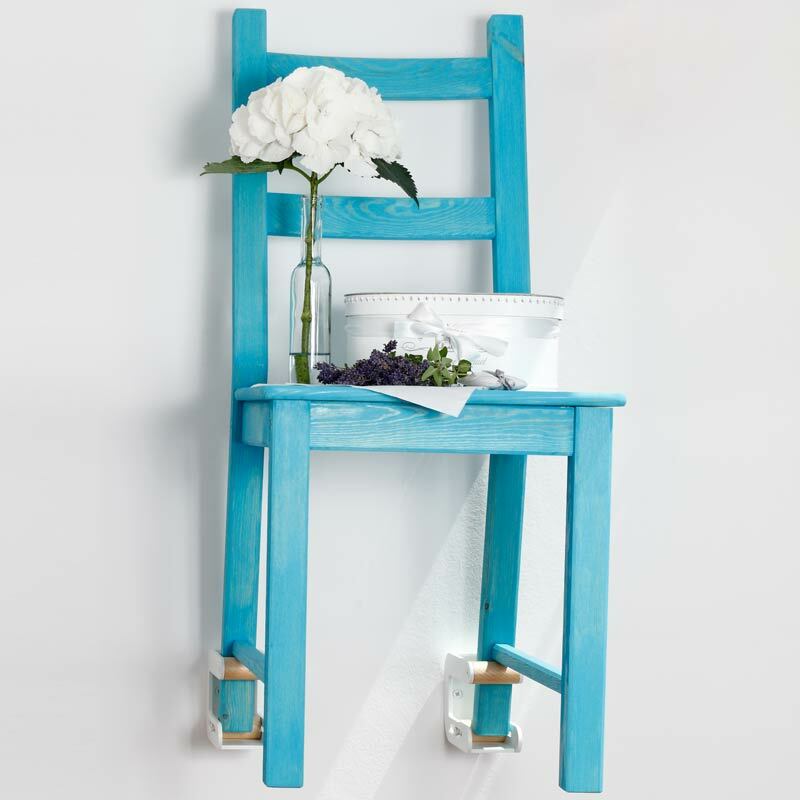 Nuwik ChAir chair holders climb any even wall surface, with chairs in hold. And if you so choose, Nuwik can even become a permanent cliff-hanger to safely take care of your chairs under the ceiling. 30 or 40 square meters of space for a single person can represent unprecedented opportunities with creative and intelligent use of space. That means saving money you can spend on what you need, such as a nice little convertible. Our cities are plagued by debt and deprivation. Rents are sky high, that’s for sure. But the choice of an adequate apartment – in terms of size and purpose – also is a key factor. 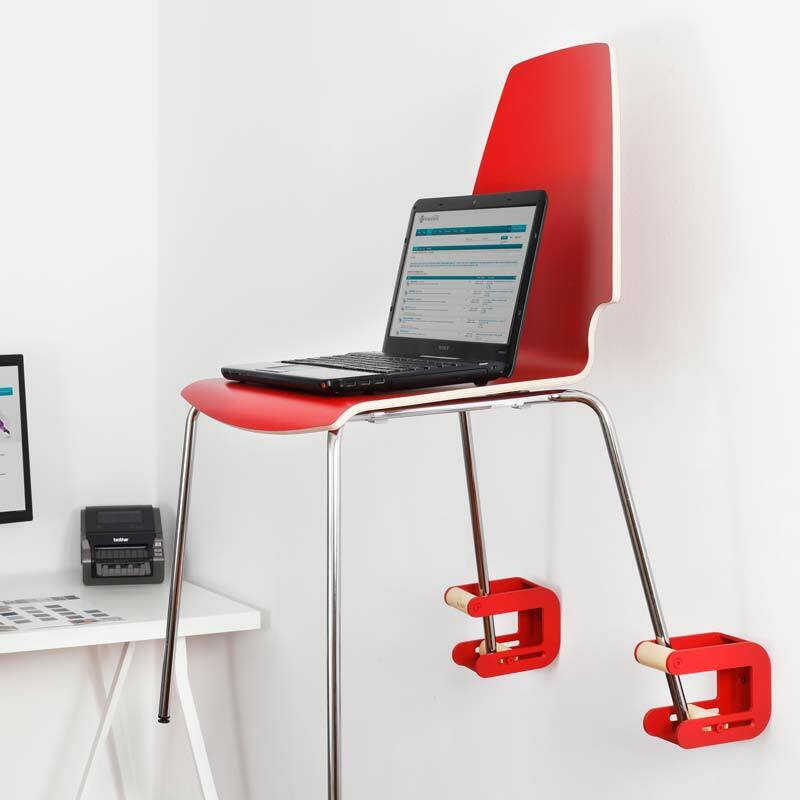 With your laptop on the chair on the wall for a change – ease your hard work and free your mind. Your back will be thankful (as certified by any orthopaedist). Where to put chairs? Move from A to B, from B to C, and back from C to A again? That’s annoying. Seating furniture is typically moved around all the time. 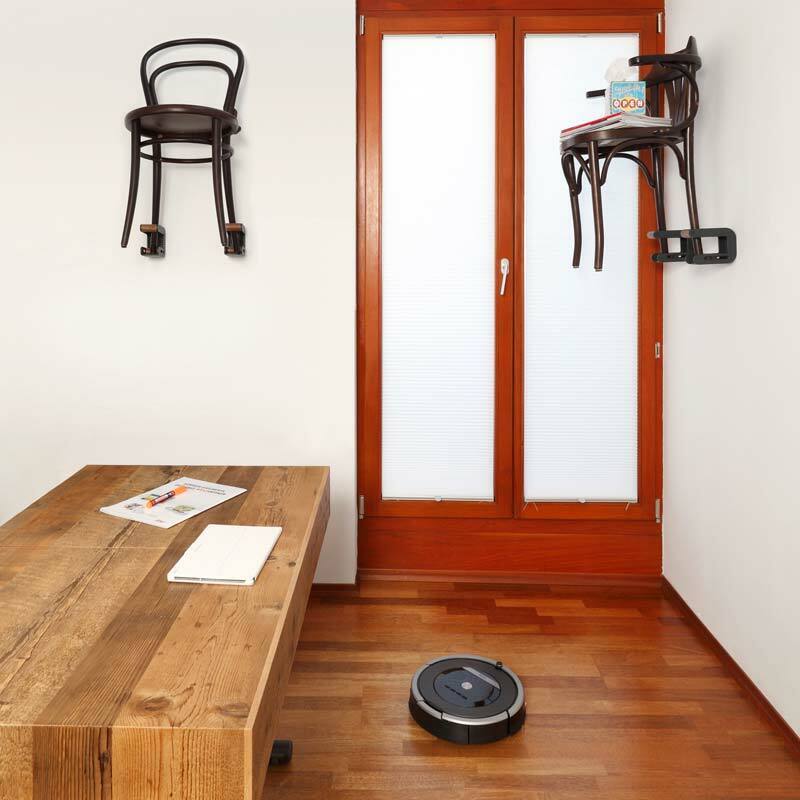 Nuwik ChAir suspends chairs (high) above ground, making vacuum cleaning and mopping up a much more convenient task. The Nuwik ChAir set units support up to 10 kilos each (depending on quality of masonry and proper reinforcement for weak walls). 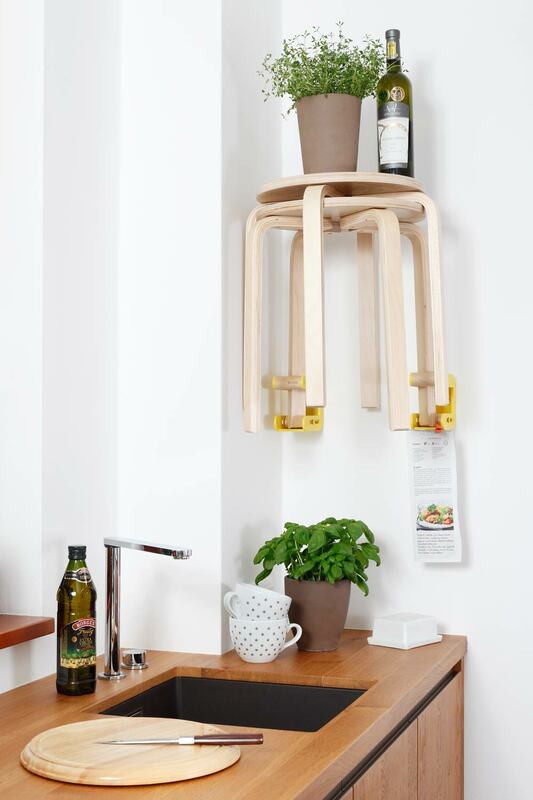 This makes Nuwik chairs a practical, suspended shelf space that makes room for conveniences such as a few glasses & plates, iPod, MP3-Player or laptop, and more. A room is a largely underestimated basic human need. Without it, we cannot survive, let alone live a happy life. Space is a largely underestimated basic human need. Without it we cannot survive, let alone live a happy life. When we ignore this basic need, it can have detrimental consequences for our marriage or relationship. Space means room to breathe. More options for better living, growth for bringing up kids, within the limits we set flexibly for them, step by step, day by day. Chairs simply are there. To sit on. Chairs hate change, getting stubbornly in our way when not in use. Chairs scratch – for instance a floor – and screech even more when being moved around, such as when being vacuum cleaned. Nuwik ChAir is soft to your chairs. It takes them with a velvet glove to secure them on walls, without leaving even the faintest traces on chair legs: perfectly stable, placed and inclined exactly at the height and in the position you need. The smart touch: Nuwik ChAir embraces each chair leg with two rolls of finest veneer that are safely held to roll out. The smoothly fitting locking mechanism fixes chair legs with diameters from 10 to 50 mm. Nuwik ChAir smoothly adapts to leg form and size and secures in place. The needed grip is provided by a single screw, with Allen key included. Nuwik ChAir draws attention at eye level to designer chairs and a flower vase or perhaps candlestick: directly on the Nuwik ChAir frame or on the chair held by Nuwik. Nuwik ChAir gives your imagination free reign and gives rooms the feeling of elevated urban living. 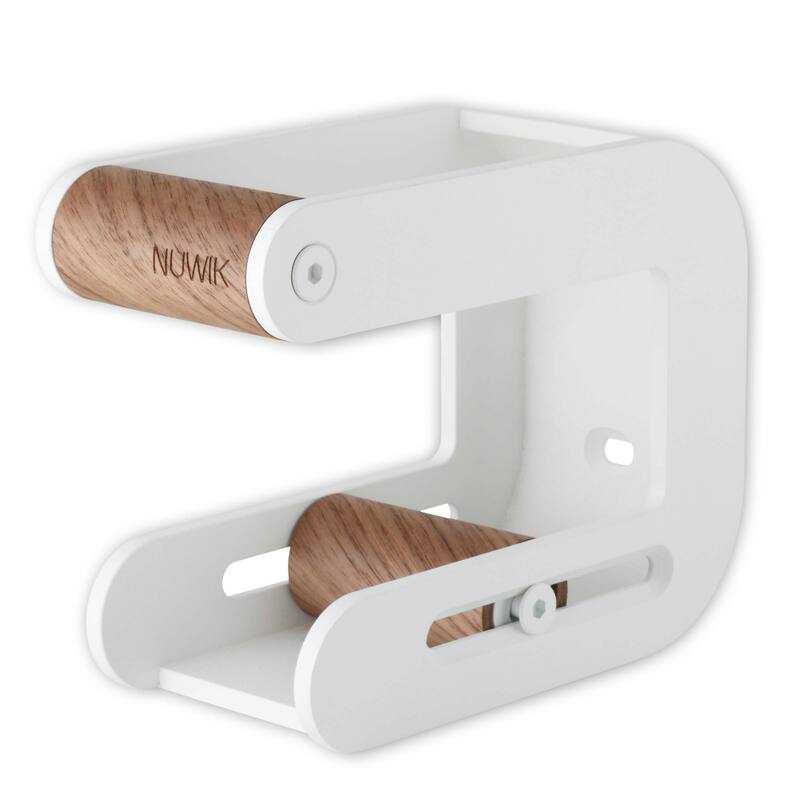 Nuwik ChAir Holder- the global innovation to actively gain more room. Moves chairs out of the way in no time, as needed. 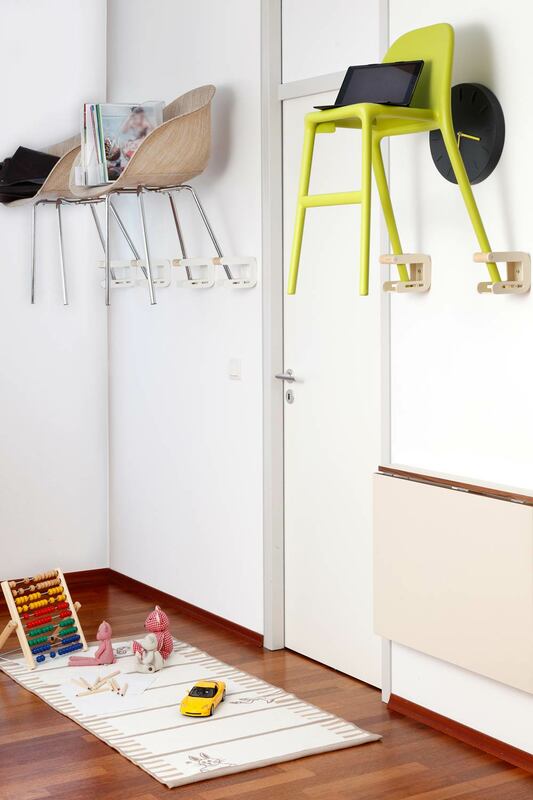 Places chairs in a ‘suspended’ position on any even wall, sloping wall, or ceiling. 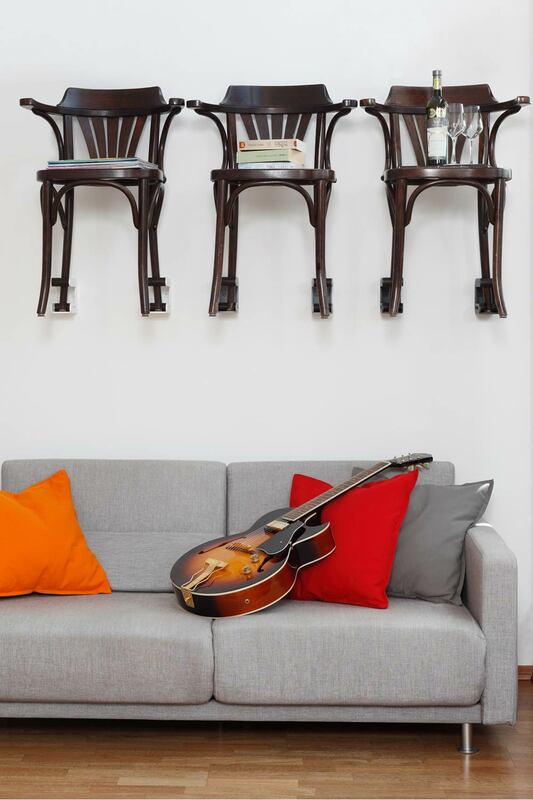 Converts chairs into stable, multifunctional shelf spaces. Works with nearly all four-legged chairs, see quick check guide. 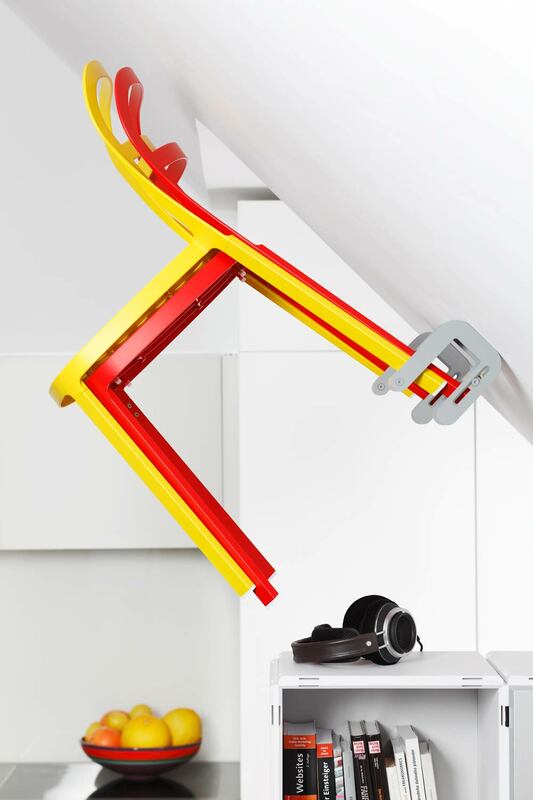 Easy on-the-wall installation, see assembly instructions..
Order and test Nuwik ChAir Holder now! Yes! I want substantially more flexibility and room in my apartment. 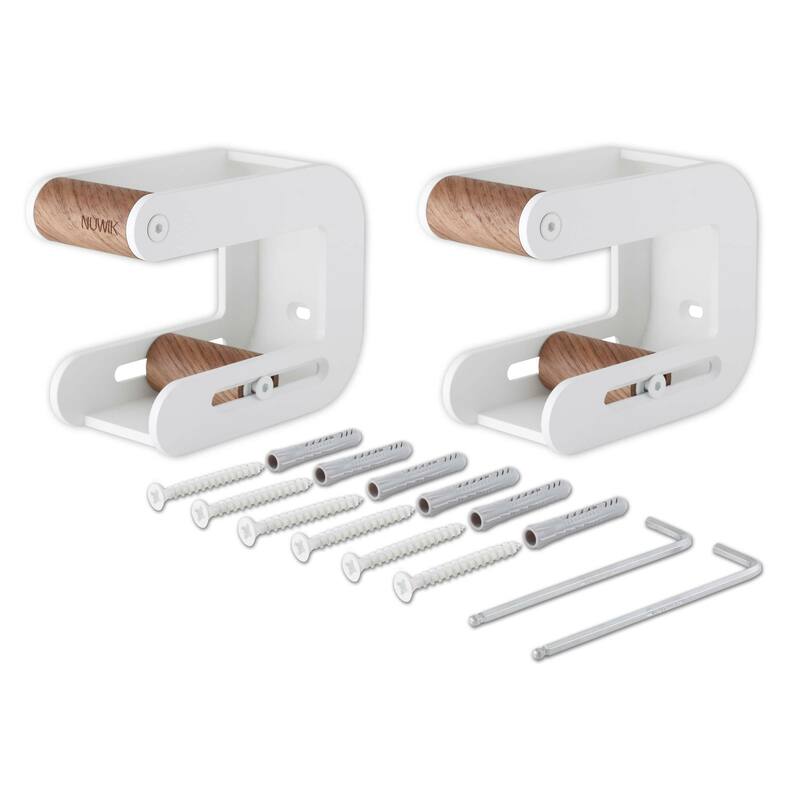 And I want to let my imagination roam freely – I want to order Nuwik ChAir Holder at a purchase price from 94,- € per set (2 units). Once your payment is received, you get your Nuwik ChAir Holder shipment (set = 2 units) within 3 business days. There are no risks associated with the order for you. Should you not like Nuwik ChAir, you can send it back in its original packaging within 30 days from the order date. Subsequently, you will be refunded the full purchase price. By clicking the green ordering button above, you will be automatically forwarded to our Nuwik ChAir-Shop. You can choose your own combinations of materials and colors there. Once your payment is received, you will receive the goods from your Nuwik ChAir order within 3 business days via DHL (delivery to a DHL office of your choice is also possible). 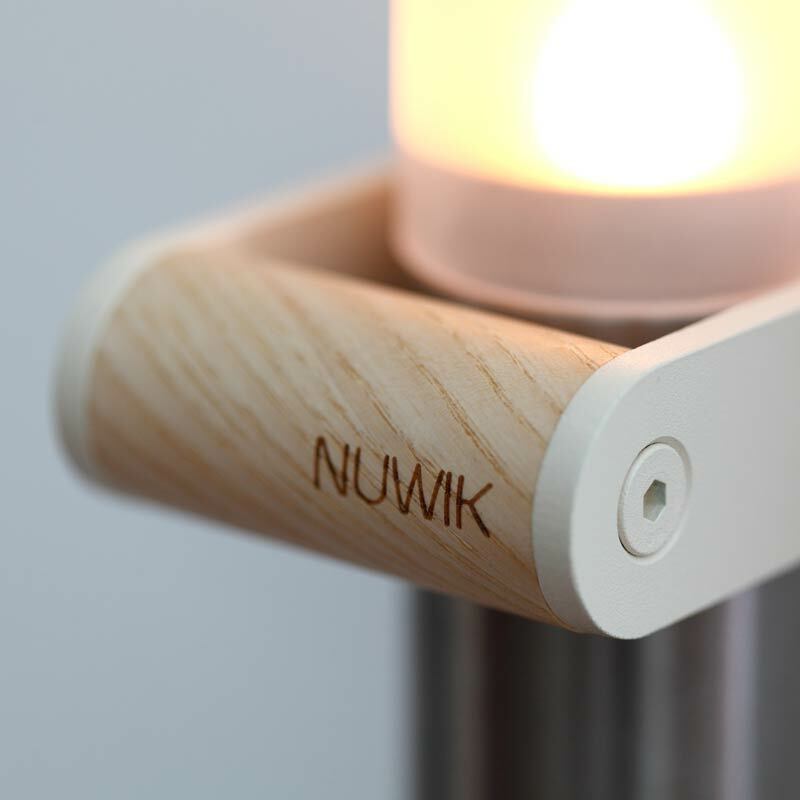 If you decide that Nuwik ChAir Holder does not meet your expectations, you will be refunded the full purchase price.